It was an overnight journey by train from Chennai directly to Mysore. It was my bad judgment of not staying a night here, instead headed for Bangalore in the evening. Mysore requires at least two days. I took one day tourist bus trip ("Sri OM Shakthi"), booked the ticket from the railway station itself (they have tie up with some private bus operator) cost Rs 120 per individual (food excluded) and Rs 170 (the Guide took in advance for all entrance ticket, he provided the tickets for each place we visited, thus avoided the queue to purchase the same, a time saver). One prudent thing i realized after the trip is over that is "Its better to cover few important places in detail then to cover everything in rush". Its virtually not possible for any tour operator to give you ample time to look around all the places he promised for, after all it was a one day trip. They didn't cover few important places like Chamundi Temple, Big Bull, Statu of Mahishasura and few in Srirangapatna despite being listed in their one day trip pamphlet. 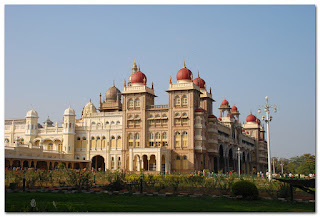 There are several palaces in Mysore which was now converted to either hotels or museum. This one was Janganmohan palace now converted to an Art Gallary in 1875. People who has even little knowledge of painting might enjoy this gallery as it hosts one of the remarkable paintings which is found only in Russia n here. Well I don't have much knowldge of the same, but one interesting thing it has is the life size musical clock made of heavy metals with extensive carve. It is said that it produce music every after 30 min through the miniature music band people postured inside the clock. 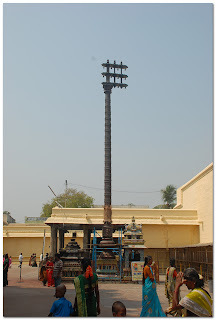 The similar structure (much smaller in size) can be seen in Chowmahal, Hyderabad. Entrance ticket is around Rs 20 and photography is not allowed :-(, they have the deposit place where you can deposit your camera. This is our second stop just 2-3 kilometer away from bus stand/Mysore Palace. 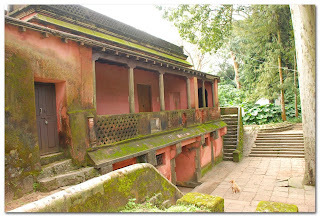 Its a century old zoo inaugurated in 1892. The unique thing about this zoo is its spaciousness. All the enclosures are spacious enough for the occupant to road around freely. Several animals are adopted by notable artists and social workers even by many Infosys groups. Its quit big spanned across 25 acres (need at least 2hr to look around). The one on the right top is Brown Lumer. Left bottom is an Mandarian Duck (cute one), right pic well you know it. 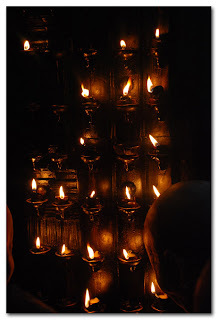 This the most famous temple in Mysore situated in hill and is few centuries old. Due to time shortage we were not able to cover this but just went upto the Nandi idol which is situated just 5km downside from the temple. This Nandi Idol is mammoth measuring 16 feet in height carved out of single black stone. It is said that there are only 5 such Nandi Idol in this world 2 in Tamilnadu (one being in Rameshwaram), 1 in AP, 1 in Bangalore (within city) and 1 here in Mysore. 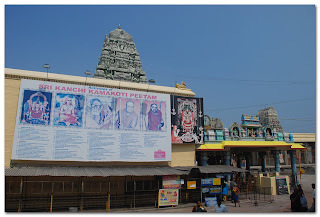 This temple can be reached by public buses which ply from city bus stand and by steps (1000 steps). The whole city can be viewed from the hill where the most attractive scene is of the race course, few palaces can also been clearly seen from here. Its said to be one of the oldest church of India and is more then 200 years old. This isn't the original architect at the time of built,initially it was a small church but over time due to growing Christianity population here the need for bigger church come to surface and the one is constructed which we are seeing today. This is built in a Cross structure, Maharaja Krishnaraja Wodeyar IV laid the foundation of this church in 1933. Was given only 10 min by the Guide to roam around. The top attraction of Mysore is this Mysore Palace. This palace is the 4th one to be built in here in the same site. Initially it was built by wood and mud (not in the same style) which was burned down completely during the wedding ceremony of 4th daughter of Maharaja Chamaraja Wodeyar in 1897. The reconstruction started immediately after that, and took almost 15 years to complete this and costs 41 Lacs at that time. The whole area is around 24 acre but the Palace is constructed within 4 acre rest is garden. The Royal family was at that time moved to Jaganmohan Palace. The whole Palace glitters in night (Sundays, Holidays and Dashera) through around 97 thousands lights running through its walls. Entrance fee is around 15 or Rs 20. Camera is not allowed inside the Palace but are allowed outside within the premises. Its in Sirangapattanum. Lord Vishnu resides here in sleeping posture. This temple is more then 1000 years old. Tipu's fort was nearby to this temple the same for where he took his last breath. The fort was completely destroyed within 6 hours of his death. The pic on right is the exact place where his body was found. With in this premises is the Masjid Gumbaz which is built by Tipu Sultan in tribute to his father Hyder Ali. Few other places to visit is Dariya Daulat Bagh, but since you are tied to your tour operator you cant do anything except follow his timelines. He was in hurry to take us to last stop i.e. Brindavan Garden (Mysore is more popular for only two tourist place, one is Mysore Palace and this Garden). Garden is 25k from here, so without stopping here we headed for Brindavan. Brindavan Garden: Now comes the last and the second most famous tourist spot of Mysore. 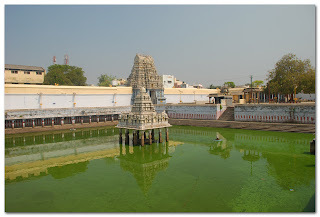 It lies around 20km away from Mysore and is built Krishnaraja Sagar Dam (one of the oldest Dam in India). The Dam spans over 3km in length and is said to be the first to implant automatic sluice gates. 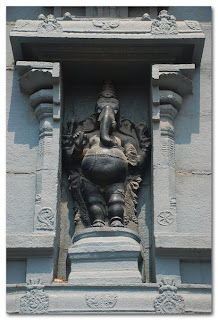 It is financed by Maharaja Krishnaraja Wodayar and thus named after him. The garden is spread over 150 acre is best known for its musical fountains of different shapes and color. Entry fee around Rs 20 and Camera costs Rs 50. That's the end of the Mysore trip, caught a bus from here to Bangalore (Rs 100, 2.5-3 hr journey). As mentioned earlier don't go for tour buses instead hire a full day taxi or visit one by one through public transport, each place is well connected by public transportation. The best is to start with Chamundi Hills in the morning, second half cover Mysore Zoo, Art Gallary and off-course shopping (Mysore is famous for its Silk Sarees). Have a night Halt, morning visit Palace then head to Ranganathan, Dariya Daulat, Gumbaz and last to Brindavan Garden in the even. 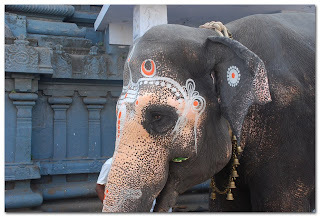 Zoo, Palace, Chamundi Temple and the Garden requires ample time so plan accordingly. Nandi Hills (also called Nandi Durg or Bull Fort/Hill) is situated around 60km from Bangalore City and is well connected by broad road. Gov bus also runs up to the top from Bangalore. This lies in Chikballapur District of Karnataka and located in close proximity to Bangalore International Airport. The road is smooth and away from the Bangalore hectic traffics. Just after around more then 20km from NH-7 (after Devanahalli Town), left diversion on this road identifies the start of the hill which is around 15km from here to to top of the hill. This hill road is wide enough for two buses to cross each other but believe me it requires great skills as visually you can't say its that wide enough. Its prudent to stop for few minutes and enjoy the hill view and have some best photo shoots. After 2 hours of the drive from Bangalore here finally we reached the entrance gate shown above. The entrance gate is not that big and secured as other forts are used to have (i haven't seen even the doors, so curious how it was secured? ).Tickets per individual is Rs 5. An interesting thing is, two wheelers are not allowed beyond this point whereas four wheelers are (except Buses). 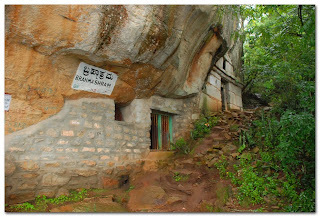 Just on the left side of the gate (after entering) is "Tipus Lodge" (shown on right side pic), a two story small building where Tipu Sultan is said to stay whenever he comes. This lodge has been declared as "archaeological site" and with that it doesn't look like its been given that importance. The building is not big as you can see it and is not open for public. 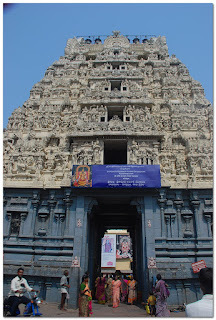 We continued to walk up along the right side of the entrance gate, few meters away is the Shiva and Parvathi temple. 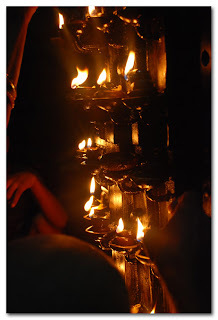 Temple is not big but it has still maintained its charm and prayers is still being offered, Shiva and Parvathi idol has been put in seperate room and both have Pujaris (Priest) appointed. Photo shoots are not allowed so we just offered our prayes and moved on. Just a few walks away this temple towards a sharp slop is a spot called "Tipu's Drop" from where Tinpu Sultan is used to throw his prisoners who were sentenced to death. Side to this temple is a small restaurant, we stopped by and had a nice tea. Now passed this restaurant crossing the the garden is another end of this fort, where on the downside is a "Nillakai Bassavana" temple, its a Nandi temple whose Nandi Idol measures 10 feet long and 6 feet in height, side to this is "Brahmashrama" cave where it's being said that Sage Ramakrishna Paramhamsa meditated here once upon a time. Inside this hill, has a few lodges best for couples to spend happy times, its a peaceful environment and cool climate. People come here as early as 4 AM to watch sun rise (near Tipu's Drop) spot. All together a must see place, Its more like an open park types then a conventional fort.